Are you thinking about visiting Croatia for the first time? If so, you are about be charmed by some of the most beautiful countries on Earth! Croatia has countless spots to visit! Plitvice Lakes National Park should be in your Croatian bucket list for sure! Plitvice lakes (Plitvička jezera) is one of THE places to visit in all of Croatia! 1. WHAT ARE THOSE LAKES AND WHY SHOULD I EVEN BOTHER GOING THERE? Plitvice it’s an ensemble of 16 natural lakes. It is an UNESCO heritage site due to its breathtaking views, its fauna and the unique turquoise waters. Plitvička jezera is located in the middle of the country and is about 130 km from the capital, Zagreb. It is great, as it makes it easy to visit in a day trip from Zagreb and from Split. 2. HOW MANY DAYS SHOULD I STAY IN PLITVICE LAKES? It depends from what you are looking for and how tight your schedule is. For instance, if you want to simply check the place off from your to-do list, or, if you are on a tight schedule, it is totally doable in 1 day from Split. If you would like to stay for more time you won’t get bored. PRO TIP: Try to start your park visit as early in the morning as possible – you will take amazing pictures and will walk the park without the crowds. It is completely different atmosphere with few tourists! 3. HOW DO I GET AROUND AND WHAT TO EAT? Its largely walking but don’t worry if you’re not that fit – you don’t need to be an olympian for Plitvice. All the transportation INSIDE the park is included in your ticket. There are ferries and a small train that will take you from one side of the park to the other. There are plenty of restaurants on station points, where you can get a snack or a full meal. Alternatively, you can take sandwiches with you and organize a nice picnic with an amazing view to the lakes! Beware of geese and ducks, they will want a part of your lunch!  By the way, if you want to visit the park with your dog, it is not a problem, there are many people walking in the park with their dogs. PRO TIP: to save your time in queuing – there are two entrances. Entrance 1 can get a bit crowded during touristic season. Just head your way to Entrance 2, it is close, and there are way less people there. 4. 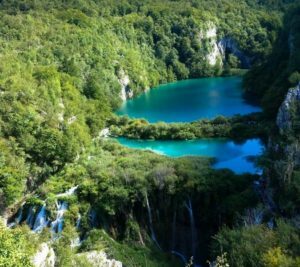 WHERE DO I GET THE BEST PICTURE OF PLITVICE LAKES? The lookout spot is called Veliki Slap. There are no signs directing you, but the place is stunning! -> follow the road for about 5 mins (you will see the Big waterfall from up) until you go to an asphalt road. ->then turn right after the bridge and, voila!, you will see THE view! 5. 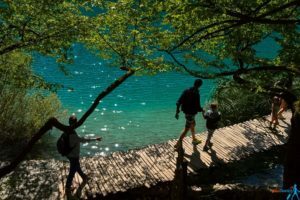 HOW TO GET TO PLITVICE LAKES? Unfortunately, there are no trains to Plitvice lakes, so the only approach is by road. The roads are great and you get to see some truly breath taking coastal views! In the case of Plitvice lakes, it is also easy, many people arrive by car and coach. 6. 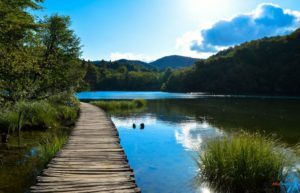 WHEN IS IT BETTER TO GO TO PLITVICE LAKES? Whichever the season, hiking shoes are not obligatory because the road is nicely done and you will be just fine wearing normal shoes. But remember, as Plitvice national park is located in the mountain area, it gets pretty cold in the evening, so, don’t forget to take warm clothes! IF THIS GRABS YOUR INTEREST WHY NOT COME WITH US ON OUR FULLY GUIDED TOURS FROM SPLIT – WELL TAKE YOU THERE IN OUR MODERN AC/WIFI TOUR BUS (SMALL GROUPS ONLY) – THAT WAY YOU’LL BE ABLE TO RELAX AND ENJOY THE DAY AND WONT MISS A THING!! !